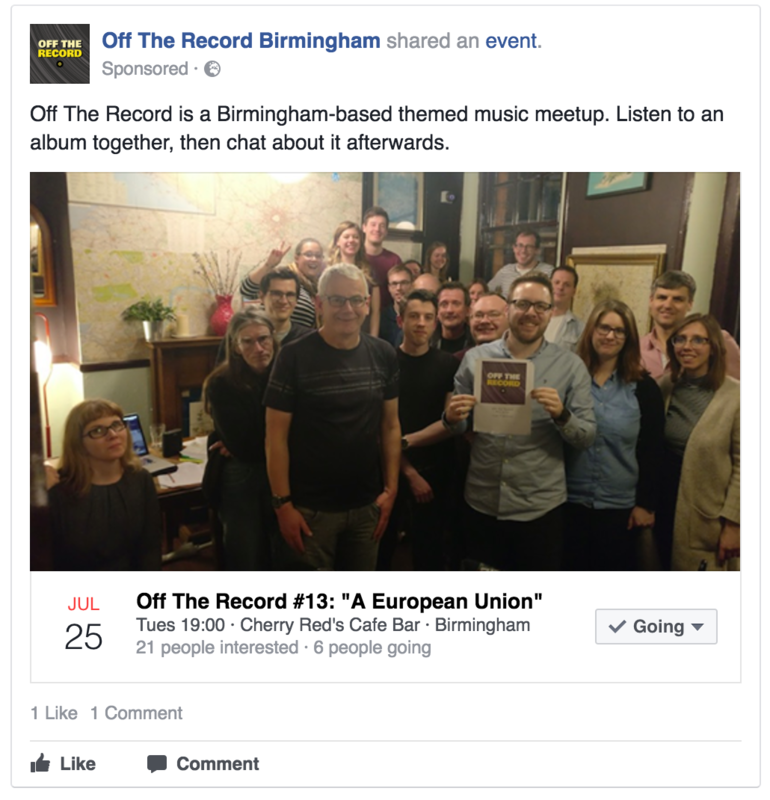 I’ve been running a regular music meetup event for over two years now, across two cities (London and Birmingham). While it’s a small event and a bit specialist/niche, I’ve learned a thing or two while running it and thought I’d share some learnings here. I know, I know – this sounds obvious. Maybe it is – I’ve not had a Facebook account since 2011 so for me personally, I don’t tend to discover events there. It turns out that everyone else does, though. A few people persistently nagged me to create a Page for the event, which I eventually did – it allowed me to tap into a wider network (I was previously just using Twitter), and I did a few paid ads right at the start to grow a bit of an audience. The first time I saw a user share an upcoming event with some of their friends without me knowing anyone involved, it was all worth it. I’m very lucky to have a loyal band of friends who come out to the things that I organise – those folks are worth their weight in gold. If you’re starting something, make sure you rope in a few trusty people to come along and even promote the event amongst their own networks. It’s helpful to have a few friendly faces there for your own sanity, but also means conversation can flow a bit at the start as people arrive, rather than a roomful of complete strangers sitting in awkward silence. Just avoid it becoming cliquey where it’s a bunch of folks who already know each other just catching up instead. 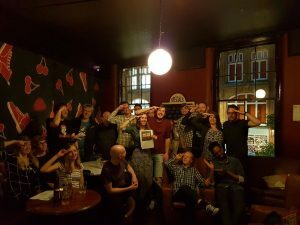 I’m very grateful to Cherry Reds in Birmingham which has hosted Off The Record since late 2015. They gave me a small room for free which we’ve eventually outgrown, and they’ve repaid our loyalty by upgrading us to the bigger room (which used to carry a hire fee). I’ve gotten to know the staff a little and they’ve been super helpful, letting me come in to test out sound systems, sharing our promotional posts on their social media, and being really perceptive and accommodating about the event itself (eg. being sensitive to the fact we’re an album-listening event and not disturbing the room during quiet moments etc). It also makes it easier for attendees that they know where we’ll be each month. Take the time to track down a good venue, look at where other events host theirs, and explain to the owners your goals and schedule. They’ll be happy to have regular business if you can prove to them you’ll bring an audience. I’ve already mentioned Facebook, but there are other tools. A fellow event organiser suggested I use Meetup.com, which would apparently help me reach a huge new audience. I paid my $15/month and, yep, I had 40 or so signups within a couple of days. Sadly, almost all of these people are no-shows when they list themselves as “attending”, or just never sign up to attend in the first place. It’s only because of the loyalty of three or four regulars there that I keep paying the subscription price. I’ve also learned to be brutal and delete people from the group who never turn up, as once I pass 50 members I have to pay even more. 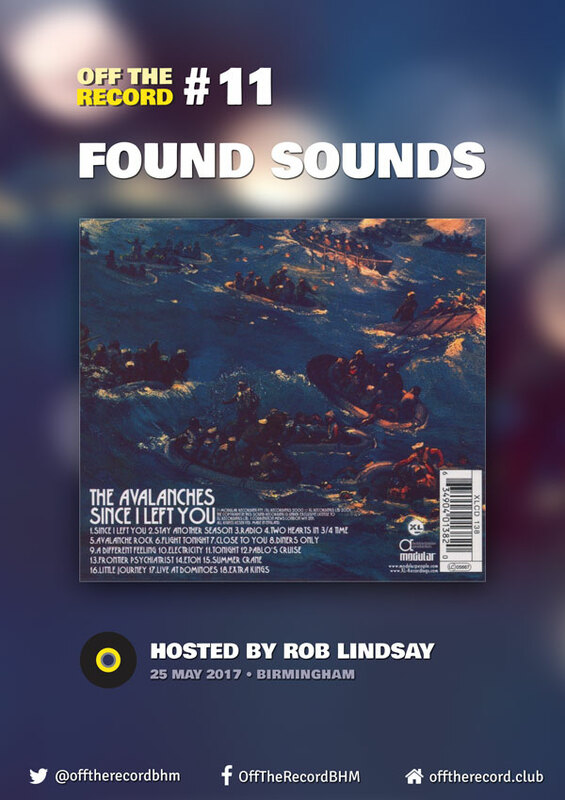 I also tried getting coverage from local Birmingham music promoters/press, but none of them ever featured anything I sent them. 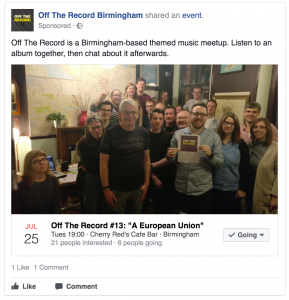 I didn’t chase hard on this and I’m sure they’re more concerned with promoting live music (and fair enough) – I think if you already have a good social media network, though, you can work around this. Sometimes a good tweet can reach a relevant local audience regardless of what account it’s from. Word of mouth works too – quite a few people I’ve spoken to recently have heard about my event now, even if they’ve not been. That’s partly because I’ve been running it on a monthly basis for the last year or so – at the start, it’s going to be difficult to build it from nowhere, but getting some momentum (and keeping it regular, not sporadic) will help. My event is a discussion forum: once we’ve heard the album of the month, we talk about it. I’m not a strict moderator but I do try to intervene if someone gets a bit self-indulgent with their thoughts on 1970s prog, or dominates the conversation somehow. Equally I try to keep things moving along before the event just turns into people chatting down at the pub – this is fun of course, but makes things feel less like an event and more like, well… just being at the pub, and therefore people might be less likely to come back in future specifically for your event. I always introduce the event formally (well, semi-formally), standing up at the start to greet everyone and introduce the concept, even though half the room are usually regulars who’ve heard me say it before. It helps contextualise things and set the tone. I also do a quick, fun intro where I get everyone to introduce themselves along with a quick, music-related fact that changes each month (eg. the first album they bought, their favourite Christmas song, etc). This helps loosen everyone up a little, and again, emphasises that we’re here to share an experience together, not just sit in a pub for a bit. These things have all improved with time: I’m still improving on things like branding (I think we’ve outgrown the A4 paper and blutack for the event posters, for example) and promotion (my Twitter friends are probably sick of me posting about it at the end of every month). Running an event can sometimes feel like a massive chore: you have to persuade loads of people that they should come out to your thing, you have to discuss with venues about audience size and room hire fees if you’re unlucky, and you have to stand up and do some public speaking. At the end of mine I’m always knackered, although this has been improving – again, great friends who are regulars often pitch in to help me out with setup tasks. But on the other hand, I always get a massive buzz from doing it. Usually at some point in the night when I know things have got off without a hitch, I look around the room and smile, feeling proud that I’ve brought these people together for an experience they wouldn’t have otherwise had. You too can bask in that warm glow! Organise something, rope in some mates for moral support, spam everyone on social media – then have a beer at the end. You’ll have earned it.